Viva el Birdos! Cement your Cards fan status with personalized memorabilia from PersonalizedThings by Exposures. Customize this St. Louis Cardinals Personalized MLB Nameplate Framed Wall Art by specifying what name you wanted printed — it can be a first name, last name or nickname. 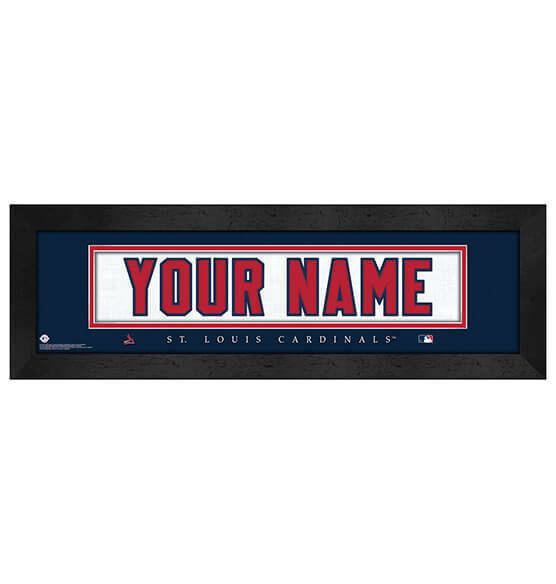 Perfect for a gift or your St. Louis Cardinals fan zone, this personalized nameplate will provide any die-hard Cards fan with a gift they will never forget. With vivid team colors and team logos, high-quality glass and a black frame that arrives ready to hang, you can't go wrong with this fantastic customized nameplate!